The Mughal empire now rules much of the sub-continent, marking a high point in the history of Indian civilization. In India and South Asia, the foundations are being laid for one of the great civilizations of ancient history. 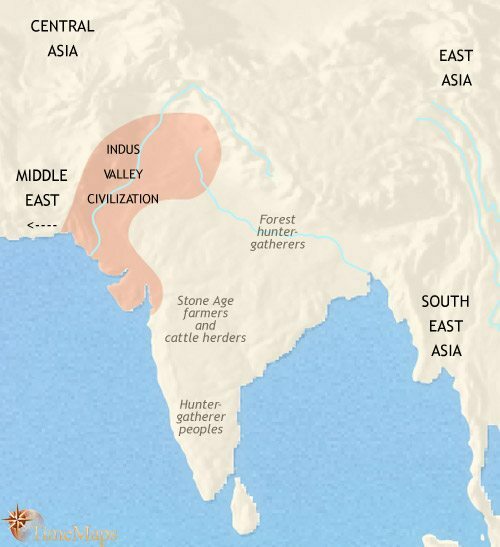 One of the earliest civilizations in world history has emerged in ancient India, the Indus Valley civilization. The history of ancient India is experiencing a dark age after the fall of the great Indus Valley civilization. In this dark age of ancient Indian history the Aryan people are laying the foundations of future Indian civilization. The return of urban civilization to ancient India has been followed by a creative period in its history, with the founding of Buddhism. The history of ancient India has seen the great Mauryan empire cover much of the subcontinent. The Mauryan empire has vanished, and ancient India sees a new chapter in its history with invasions from Central Asia. 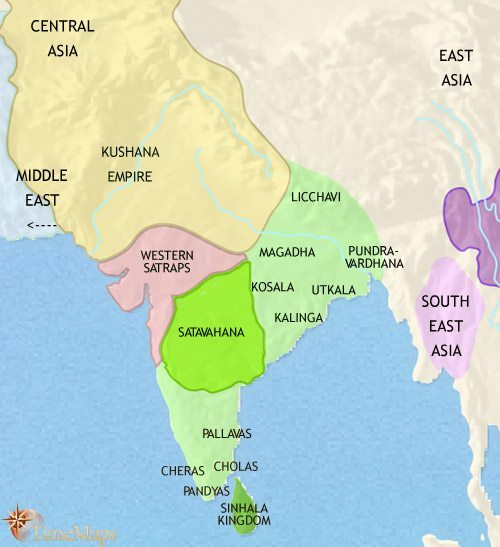 The Kushana empire of ancient India is important to world history as a centre for the spread of Buddhism. This period of India's history has seen the rise of the Gupta dynasty, under whom ancient Indian civilization reaches its peak. At this stage in India's history, powerful regional kingdoms divide the subcontinent. This period of its history sees the south emerging as a major centre of Indian civilization. India has entered a new chapter in its history with the expansion of the British empire in the subcontinent. 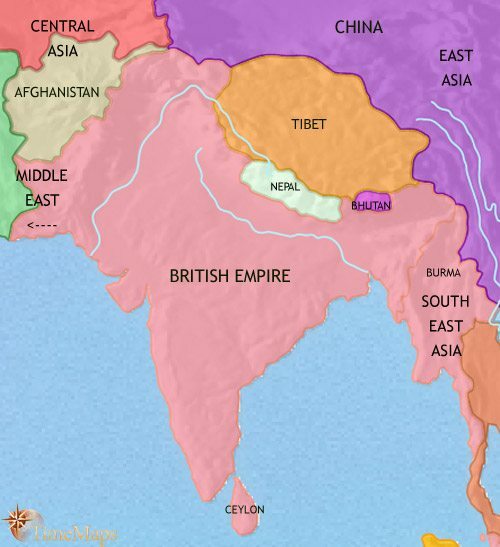 The British empire now dominates most of India, marking the most radical change in the long history of the subcontinent. The history of British India almost ended in a great rebellion, but the British were able to regain control. The history of the British empire in India reaches its height - but it will shortly come to an end. The long history of India and South Asia has entered a new chapter with the replacement of the British empire by independent republics. The history of India and Pakistan has been characterised by mutual hostility. A new power has by now conquered much of the Indian sub-continent. 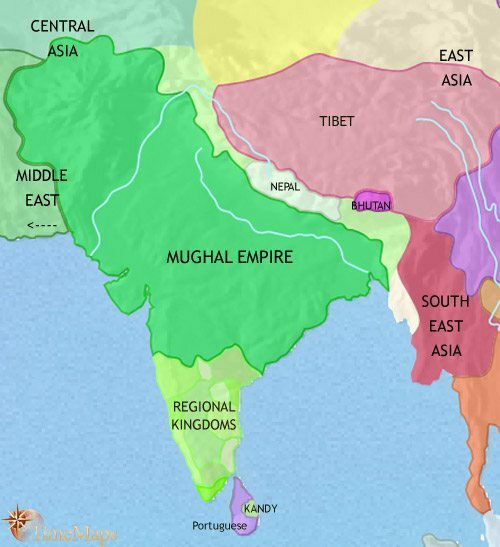 This is the Mughal empire (also spelt Moghul or Mogul empire). It was founded by a prince from Afghanistan called Babur (reigned 1526-30). 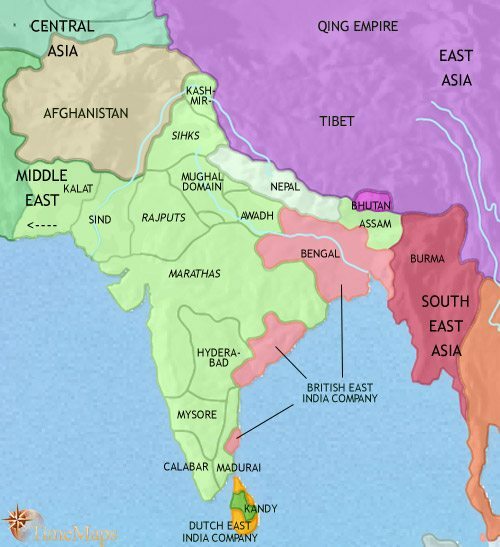 It has not yet reached its full extent in terms of territorial coverage, but for internal cohesion and cultural and economic achievement, it has been at the height of its power since the days of Akbar the Great (reigned 1556-1605). This Indian state is one of the great empires of world history, with a stability that rests on a tolerance between Muslims and Hindus. This allows members of both faiths to belong to a unified ruling class. Further south, both the Bahmani sultanate and the Vijayanagar kingdom have fragmented into numerous states. In north-west India, a new faith has appeared, Sikhism. The Sikhs are led by a succession of gurus, starting with Guru Nanak (1469-1539). He preached tolerance and peace between members of different faiths, and the Sikhs embrace different elements of both Islam and Hinduism. They reject religious hierarchies and the caste system. With such beliefs it is unsurprising that they meet hostility from both Muslims and Hindus. By the mid-17th centuries, the coasts of the subcontinent are dotted with small European trading bases, especially those belonging to the Portuguese, the Dutch, the French and the English. The last three are controlled, not by their governments, but by their respective East India companies. The Indian sub-continent is home to a great variety of peoples. In the north and central regions, agriculture has been established for more than two thousand years, and populations of farmers grow barley, oats, rye, wheat, beans, peas and lentils, and keep goats and cattle (Zebu). In the north-west of the Indian subcontinent, especially in the fertile Indus river valley, some communities have grown into sizeable villages. Craft specialization has appeared – the inhabitants produce high quality painted pottery and crafts including copper jewellery. It will be in this region, in the Indus Valley, that urban life will come first to ancient India, with the emergence of one of the earliest civilizations in world history. In central and southern India, farming is much more recent, and much of the land has still not been cleared for agriculture. Small farming villages are scattered across the land, surrounded by large tracts of untamed forest and savannah remain, sheltering populations of hunter-gatherers. Over the past thousand years, towns and cities have appeared in the floodplain of the Indus river valley, covering a vast area of northern India. Some of these cities are amongst the largest in the world at this time. The history of this ancient civilization is very obscure, but it shows signs of having spread from a single centre, perhaps near the delta of the river Indus, across much of modern-day Pakistan and north-western India. The towns and cities show a high degree of uniformity of layout and design. The cities contain what are thought to have been granaries, public baths – perhaps for ritual purposes – and the earliest known sewage and drainage systems. In several of the cities the streets are laid out along a grid pattern – apparently the first case of town planning in history. There is an active trade with Mesopotamia. There is also evidence of a written script, but this has as yet not been deciphered by modern scholars. In the rest of India, simpler, more ancient modes of life prevail, a patchwork of farming villages, hunter-gatherer bands and semi-nomadic pastoralists. The past thousand years have seen the Indus Valley civilization flourish, until about 1800 BC. It then began to decline. 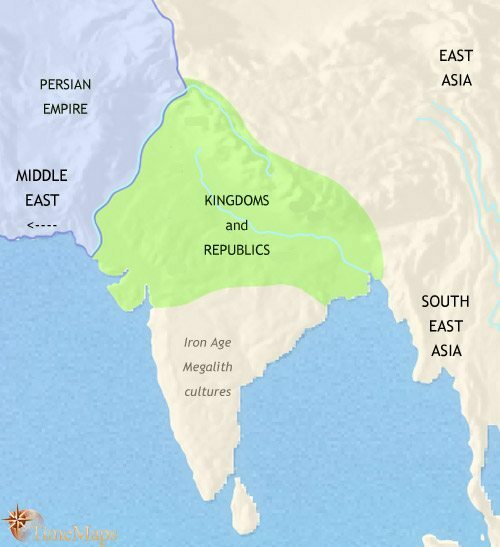 The history of ancient India during these centuries is obscure, but this decline has been linked by modern scholars to environmental factors, such as change in climate patterns or an overuse of land and water resources; migration by Indo-European tribes from central Asia may also have been another factor. In any event, by about 1700 BC the large cities of the Indus valley had disappeared altogether. At about the same time, newcomers to India made their appearance, Indo-European speaking, semi-nomadic pastoralists from central Asia. They have brought with them the domestic horse and two-wheeled chariots, and have begun spreading out over the great plains of northern India. These “Aryans” are already starting to compose an oral poetry consisting of hymns, spells, rituals, dialogues and proverbs, which in later times will form the Vedas, the ancient foundation literature of Hindu civilization. These reflect a world under the rule of warrior aristocrats. 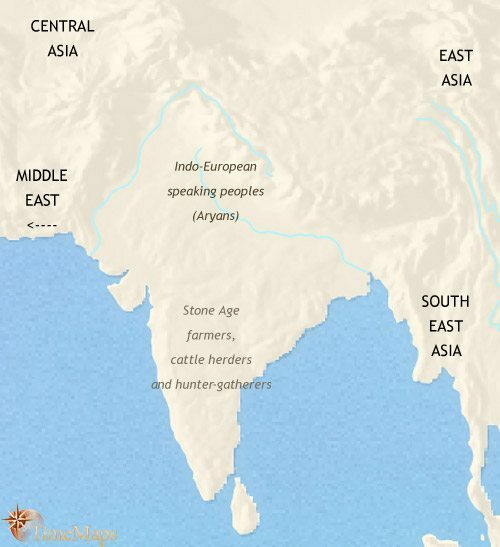 The past centuries the Indo-European peoples (Aryans) have spread across northern India and have begun to live in settled villages and tribal states. These are ruled over by the leaders of prominent Aryan clans, now emerging as kings. It is probably around this time in ancient India’s history that the four earliest castes appear in Aryan society: Brahmins (priests), Ksatriyas (warriors and rulers), Vaisya (the broad mass of tribesmen – farmers, craftsmen and merchants), and the descendents of conquered peoples relegated to a subservient role in society as Sudras (servants and labourers). This simple four-tiered caste system will become ever more elaborate as the history of India progresses. At this time also, a rich religious oral tradition is being developed, revolving around the doings of the Aryan’s pantheon of gods and goddesses. This will later form the Vedas, the most ancient scriptures of the Hindu world and one of the most important foundations for Indian civilization. 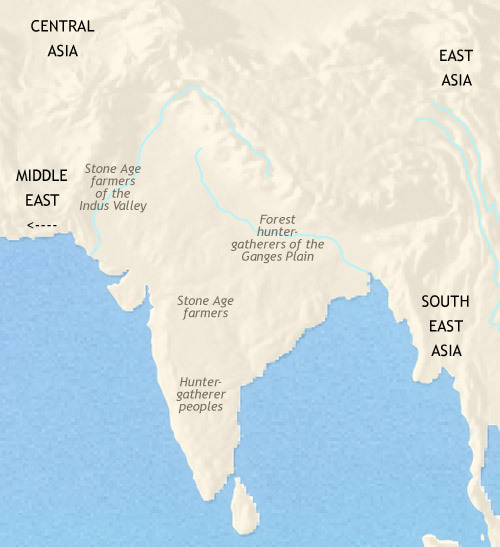 Over the past centuries, growing populations and expanding trade links with the Middle East have stimulated the rise of urban civilization again in the Aryan heartland of ancient India. A network of towns, cities and trade routes is growing up, supported by highly productive agriculture using iron tools (which have spread in from the west). A Sanskrit script – based on the Aramaic script of the Middle East – is probably in use by this date and, shortly, a system of coinage will appear. These developments point to the renewed importance of trade routes between South Asia and Western Asia. The various Aryan tribes have coalesced into sixteen major states which now cover northern India. Most of these states are ruled by kings, but some are republics, governed by oligarchies of noblemen. This period of Indian history is one of great intellectual achievement. The foundations of early Hinduism have long been laid, but the religious assumptions that underpin it are being challenged from various quarters. Two teachings of enduring significance emerge from the spiritual and philosophical tensions of ancient India. Buddhism has been founded by Gautama Siddharta (better known as the Buddha by billions of people today), which will be one of the most influential faiths in world history, and Jainism, founded by a teachers called Mahariva. In southern India, the Tamils are emerging as the dominant group. The peoples of the south are adopting the use of iron implements, and farming is advancing at the expense of pastoralism and hunter-gathering. The past centuries have seen the first attempt in history at the conquest of India by a western power, when Alexander the Great briefly led his army into the Indus Valley, in 327 BCE. This episode was quickly followed by the rise of the first great empire in ancient India, that of the Maurya. At its height, this empire covered most of the sub-continent, together with neighbouring regions in central Asia. Its most notable ruler was the devout Buddhist king, Ashoka (also spelt Asoka – reigned 268-241 BCE), one of the most remarkable figures in world history. He sought to apply his faith to ruling his vast territories. 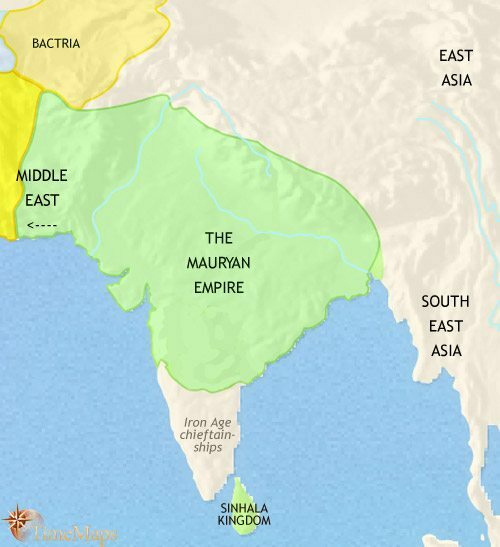 Since Ashoka’s death, the Mauryan empire has gone into decline, and will shortly fragment into many independent states. By that time, however, Aryan civilization will have become firmly established in central India, and soon the first large regional state will appear there. To the north-west, the presence of the Greek-ruled kingdom of Bactria is a conduit for western influences upon Indian civilization, and vice versa. Since 200 BCE the Maurya empire has vanished from the geo-political scene in ancient India. In its place a multiplicity of kingdoms have sprung up across northern India. These have proved no match for a people from central Asia, the Scythians, who now dominate much of this region. They have formed the first of the great empires in Indian history to originate in central Asia. In the northwest of the subcontinent the mingling of Greek, Indian and central Asian influences have led to the rise of the Gandhara culture. In this region, Greek, Middle Eastern and Indian philosophies and religions rub shoulders with each other, and artistic techniques and motifs from the different areas combine to produce new styles. The Gandhara culture will have a large impact on all later Indian and Persian civilization. 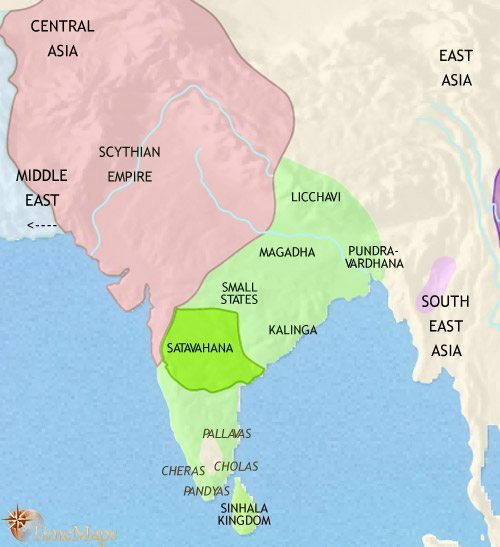 In central India, a powerful kingdom ruled by the Satavahana dynasty, has emerged, the first of a series of important kingdoms based in the Deccan. It has come under strong attack from the Scythians (or “Sakas”, as they are called in India). The bone of contention between the two states is the west coast, with its growing Indian ocean trade with the Mediterranean world. In South India the leading chiefdoms, the Cheras, Cholas, Pallavas and Pandyas, are beginning to transform themselves into organized kingdoms. The economy retains pastoral elements but is shifting more towards settled farming. The introduction of rice into this area is providing a spur to economic and population growth. Inscriptions testify to the spread of trade, towns and the religions of the north, Hinduism and Buddhism. The Scythians’ power has been eclipsed by that of the Kushana, another central Asian people who invaded north west India in the first century AD. The Kushans have created one of the great empires of the time, and their kings have presided over a period of commercial expansion, urban growth and artistic achievement. The Kushana are Buddhists, and their realm is pivotal to the spread of Buddhism into central Asia and eastern Asia, to China and beyond. Also, Mahayana Buddhism is established as a separate branch of the religion under Kushan patronage. In the cultural sphere, the art style developed under Kushan patronage, a mix of Indian, Persian and Greek elements, will have a long-lasting impact on Indian sculpture and painting. Beyond the Kushana empire, northern India continues to be covered by states of varying size, mostly kingdoms but also some republics. Both Hinduism and Buddhism flourish here, as they do in the Satavahana kingdom. This has expanded over a large area, and the wealth and power of the Satavahana kings is reflected in the construction of spectacular cave temples. By this time in the subcontinent’s history the kingdoms of southern India have become fully established, and are frequently at war with one another. Overseas trade with both the Roman Empire and South East Asia means that commerce plays an important role, and a comparatively dense network of towns is appearing. Within these towns, merchant and craft guilds are powerful; banking is important and a fully developed money economy is in operation. The central Asian powers, the Scythian and the Kushana, which once ruled much of northern India, have vanished. Another great Indian empire has arisen, that of the Gupta. 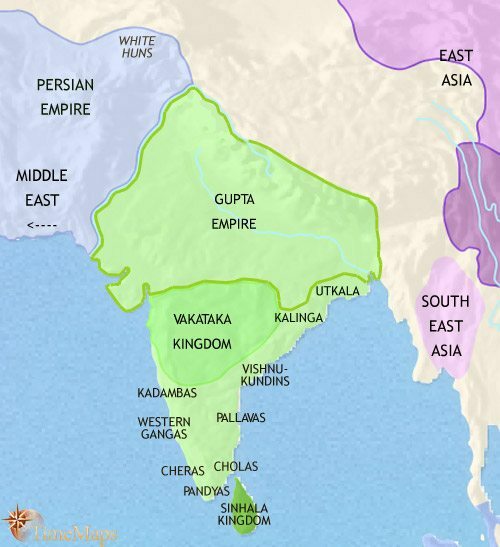 The period of the Gupta empire is often seen as the one of the most brilliant in ancient India’s history. The Gupta emperors rule northern India directly, and, through political and family ties with the Vataka in the Deccan, have had great influence in central India as well. By this date, however, both the Guptas’ and the Vakatas’ power is in decline, as fierce invasions by the Huns from central Asia weaken them, and subordinate kingdoms assert their independence. The Gupta preside over one of the most productive periods of Indian civilization. Advances are being made in many fields of science, art and literature. Most notably, it is probably about now that Indian mathematicians develop the decimal system of numbers. This system will be crucial to future mathematical and scientific progress in world history. The kingdoms of the south, the Pandyas, Chola and the newly powerful Pallavas, continue to develop their maritime trade. At this time, the trade with the west is in decline as the Roman Empire retreats from its former glory, but this is more than made up for by the growing trade with South East Asia, which expands in response to the growing economic demands of south China. 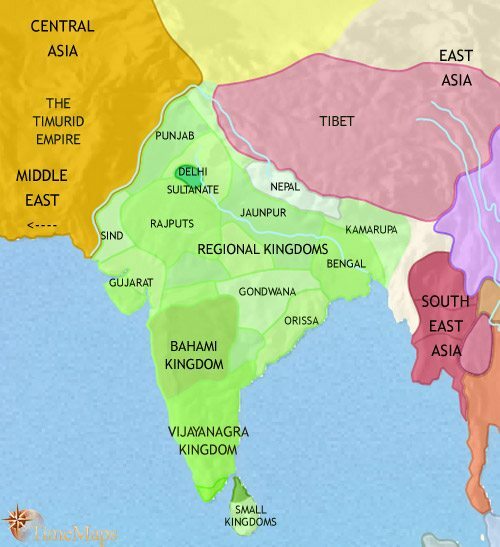 With the fall of the Gupta empire in the 6th century, no state has been able to win control of much of the subcontinent for any length of time; this stage in India’s history has been characterised by the emergence of powerful regional kingdoms. A great conqueror, Harsha, briefly united northern India under his rule in the first half of the 7th century, but his empire fell apart immediately after his death in 647. 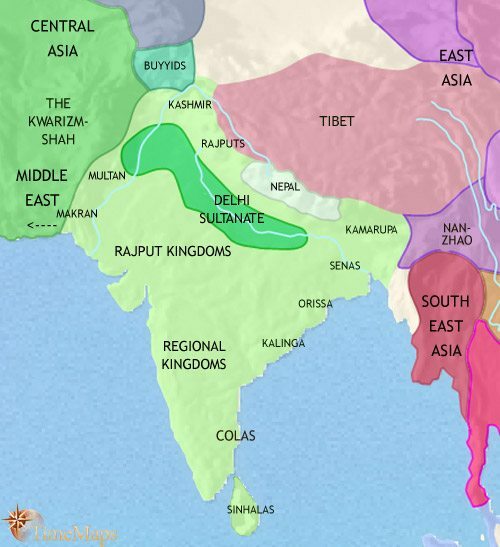 Since then, the Indian sub-continent has seen the rise of several large regional kingdoms, particularly the Gurjara-Pratihara in the north-west, who act as a bulwark against further Muslim advance after the Islamic Caliphate‘s take-over of the Indus region; the Pala in the north-east, and the Chalukya in the Deccan. More or less equally balanced in strength, the struggles between these three states will soon dominate the history of northern India. The Pallavas have become the dominant power in southern India. There have been almost continual hostilities between the Pallavas and the Chalukyas for control of the fertile and commercially strategic east coast. Much territory has changed hands, but neither side has gained a decisive advantage. The Pallavas now face a threat in their backyard, from the Pandyas, who have re-established their power on the tip of India. Within the sub-continent, Buddhism is in decline by this date – the Palas are the last major Indian dynasty to patronize the religion. Hinduism is gradually becoming the dominant faith in the region. In northern India the powerful dynasties which had contended for mastery, Gurjara-Pratihara and the Palas, are in decline, their power devolving to subordinate princes. Many of these style themselves Rajputs, a designation which roughly means “warrior prince”. In the Deccan, the Chalukyas were displaced by a new dynasty, the Rastrakutas, who seized power in 753. The Rastrakuta monarchs were militarists, seeking to extend their territory in all directions, making their empire the most powerful state in the subcontinent. They were only prevented from further conquests by repeated rebellions at home. In 973, they were ousted, and replaced by a line of kings calling themselves the Later Chalukyas. 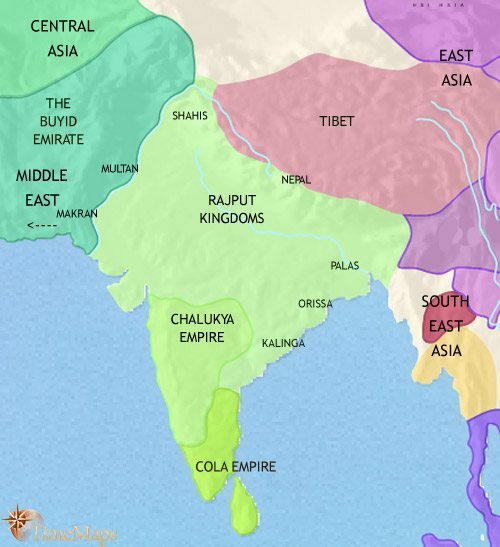 In the south, the Chola kingdom has become the dominant power, first winning their independence from the Pallavas in 850 and then subduing both the Pallava and the Pandya kingdoms. Unfortunately for them, their ambitions brought them into conflict with the Rastrakutas of the Deccan, who defeated them (949) and took much territory from them. The rising importance of the south was felt, not only in the political field, but in culture as well. In fact, it dealt a fatal blow to Buddhism in the sub-continent of its birth. Buddhism had never thrived here, and the spread of popular southern Hindu cults in India robbed an already declining Buddhism of its distinctive appeal. Spiritually, the new Hinduism offered people a salvation experience similar to Buddhism, and socially, the new cults’ luke-warm approach to caste offered low-born Indians a similar degree of equality as Buddhism had done. From 1000 onwards, Mahmud of Ghazna, a Muslim ruler in central Asia, conducted many raids into India and conquered the Punjab. After Mahmud’s death, and his successors’ defeat by the Seljuqs (1040), the Ghaznavids shifted their power-base to the Punjab, the vanguard of a Muslim invasion of the sub-continent. The Rajput princes of northern India held off the Muslim invaders for a time, but their resistance was hampered by continual fighting amongst themselves. In due course, several Muslim sultanates established themselves in the north, the Sultanate of Delhi being the most powerful. 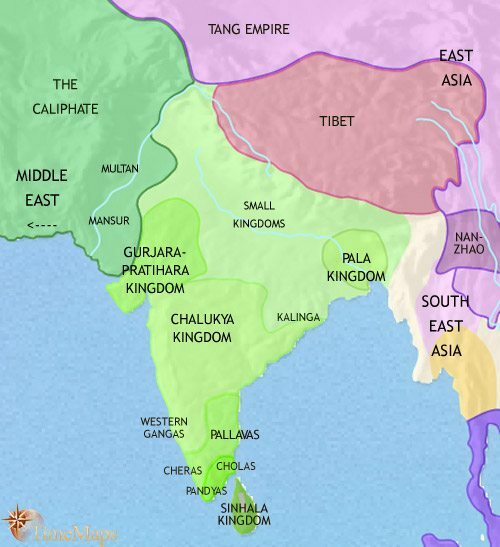 In the Deccan, the large Chalukya kingdom broke up into several large states at the end of the 12th century. In south India, the Chola kingdom renewed its expansion in dramatic style in the closing decades of the 10th century. They conquered territory both within India and overseas, with expeditions to Sri Lanka and even (according to their records) as far afield as South East Asia. By the early 13th century, however, Chola dominance of southern India is being challenged by other powers, in particular the resurgent Pandya dynasty. The coming of alien Muslim armies into India seems to have completed the decline of Buddhism in its Indian homeland. It also seems to have started a process whereby Hindus emphasised certain features of their faith, the better to differentiate themselves from the Muslim newcomers. One of these features was caste. From now on, the caste system seems to have started becoming increasingly rigid. This process would continue for several centuries. The past two and a half centuries of India’s history have seen, first, the expansion of the Delhi Sultanate throughout India, immediately followed by its rapid disintegration. This process was greatly helped by the sack of the capital, Delhi, in 1398, by the forces of the central Asian conqueror, Timur, invading from Iran. By this date the sultanate is merely one amongst many small states in northern India. The rise and decline of the Delhi sultanate has left a legacy of Muslim princes ruling in many parts of the sub-continent, along with older Rajput regimes, who have come to an accommodation with their Muslim neighbours. Although much of India is ruled by Muslims, the mass of the population largely remains true to its ancestral Hinduism. For the most part the Muslim rulers do not attempt to impose their own religion of their subjects, and indeed most employ Hindus as senior officials in their governments. In art and architecture, Muslim and Hindu elements are fusing together into a new style which will, in due course, give rise to such wonders as the Taj Mahal. In the south, two powerful states have been established in the wake of the Delhi sultanate’s conquests there. One is the Bahami sultanate, a powerful Muslim state, and the second is the kingdom of Vijayanagra. This is a Hindu state, whose rulers see themselves as the champions of the old religion against the alien forces of Islam. These two states are at almost constant war with one another. The Mughal empire expanded still further after 1648, and by 1700 covered most of the Indian sub-continent. However, its power was to a large extent illusory, and in the first half of the 18th century the Mughal empire fell into decline. Powerful governors broke away to found independent states, and rebellions led to the rise of such new powers as the Maratha Confederacy, in the south and centre of the sub-continent. A powerful invasion from Persia, which sacked the imperial capital of Delhi (1738-9), set the seal on Mughal decline. In the north-west, the Sikhs, though originally pacifist, had to take up arms in the face of persistent Mughal persecution. As Mughal power declined, Sikh war leaders have established several kingdoms. Meanwhile, a completely new element has entered Indian history. 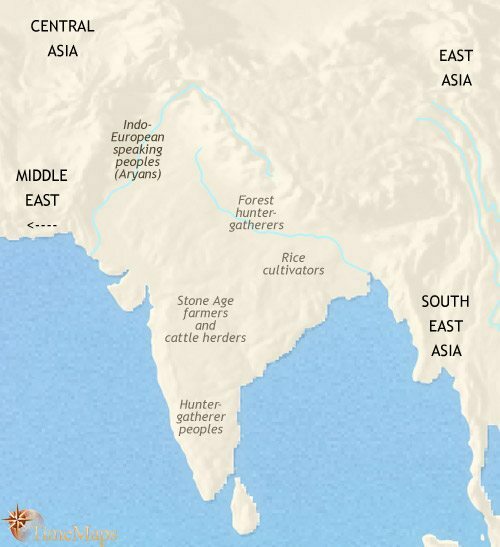 European merchants had established trading posts around the coast of the sub-continent even before the rise of the Mughals. As the empire gave way to a host of competing successor states, the European trading companies were increasingly drawn into the conflicts which surrounded them, in order to protect and further their commercial interests. The British East India Company and the French East India Company were the most influential of these organizations, and the competition between them became one element within the global struggle between their two home countries for trade and colonies. The resulting wars for influence between the French and the British companies have gone decisively in Britain’s favour, thanks to the ability of Britain’s navy to control the seas. They have resulted in Britain (i.e. 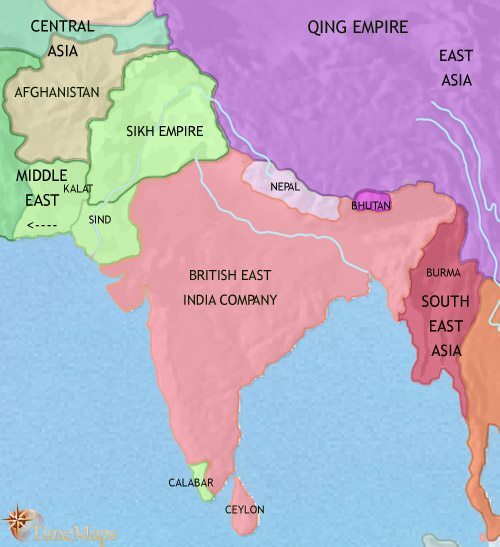 the British East India Company) acquiring large chunks of territory in northern India. From its base in Bengal, the British East India Company – surely the most influential company in all world history – has extended its control across the sub-continent. It has defeated the powerful state of Mysore and the states of the Maratha confederacy in a series of hard-fought wars, and has brought many other principalities, including the key states of Hyderabad and Awadh, into its alliance system. 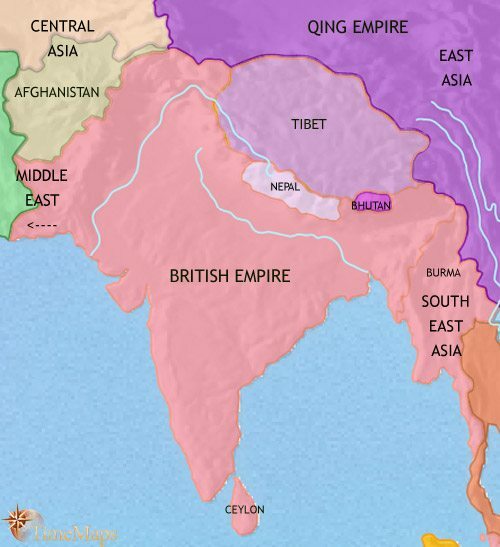 The British have also expanded their power into Nepal (1814-16) and western Burma (1826). Through direct and indirect rule, therefore, the British East India Company now dominates most of the sub-continent. Meanwhile, the Panjab has come under the control of a remarkable ruler, Ranjit Singh (ruled 1799-1839). He has fused the various Sikh states into a unified empire, covering an area as large as a major European country such as France. He has maintained good relations with the British, and has introduced a high level of administrative efficiency across his domain. In military terms, his well-trained troops are armed with European-style weapons, and the British regard his forces as equal in quality to their own. His reign has brought peace and prosperity to the people of his empire. After Ranjit Singh’s death in 1839, the Sikh empire which he had so skilfully built up rapidly fell into chaos. The army of the British East India Company then marched in and brought its territory under its control. This left the British in complete control of the Indian sub-continent. In 1857, however, the history of the British empire in India almost came to a sudden and violent end when many Indian troops in the Company’s army rebelled against their British masters. The rebellion spread, and was supported by many Indians, of all castes, including some princes. Several important cities in northern India fell to the rebels. The majority of the Indian troops remained loyal to the British, however, and several Indian princes rallied to the British. 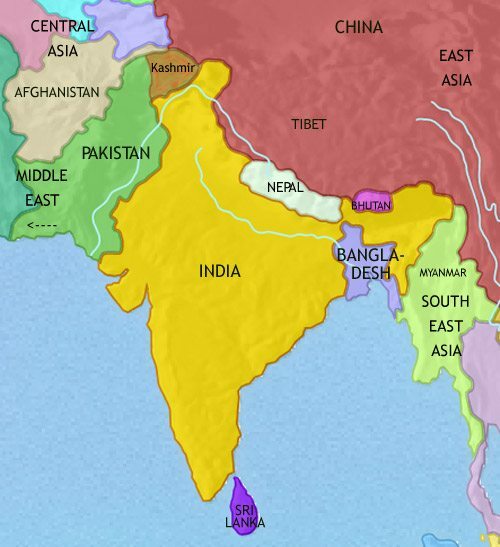 All the southern part of India remained untouched by the rebellion. Nevertheless, it was only with the utmost difficulty that the situation was brought under control. The rebellion lasted more than a year. By the time peace had been restored, the British had brought an end to the rule of the East India Company. From now on, the British parliament took over direct responsibility for governing India. The British set about creating an efficient civil service, which was inspired by the Chinese imperial system, and became the model for the civil service in Britain. Meanwhile, the British have been extending their power into most of Burma, and have also made a disastrous attempt to bring Afghanistan under their control (1838-42). Within the India, the British are beginning to introduce industrialization, most notably in starting to develop a railway system which will span the subcontinent. The official in charge of the British administration in India, the Viceroy, is a politician appointed by the British government and answerable to parliament. He heads a civil service which governs a large part of the sub-continent directly, and the rest indirectly through the (almost 600) princes which the British have kept in place. The British viewed with concern the deepening involvement of Russia in Central Asia, seeing it as a threat to their control of India. The diplomatic and military confrontation known to history as the “Great Game”, in which Britain and Russia jockied for influence in Afghanistan and Central Asia, led to the 2nd Afghan War (1878-80). The British were able to put their own nominee on the Afghan throne, but the Russians, in retaliation, have annexed further Central Asian territories. It was only in 1909, when Russia and Britain agreed on separate spheres of influence in Afghanistan, Persia and Central Asia, that the tension abated. This period of its history sees India entering the industrial age. The British are building a vast railway system covering the whole of the sub-continent – by far the most extensive network outside Europe and North America. Extensive road-building and a comprehensive postal and telegraph system also helped tie the vast region together. A large and prosperous textile industry, plus some mining and steel-making, were also modern sectors of the Indian economy. The vast bulk of the population however, remain untouched by such developments. They live in rural villages, their lives much as their ancestors had known, tending their fields or engaging in traditional handicrafts. The peoples of South Asia have entered a new chapter in their history, with the replacement of British rule by several indepent countries. The years after the World War 1 saw a growing independence movement, under the charismatic leadership of Mahatma Gandhi and Jawaharlal Nehru. The ambivalent attitude of its members towards supporting Britain during World War 2 did not prevent Indian troops from performing invaluable service to the Allies, especially against the Japanese in Burma. The British knew they had no choice but to grant India independence; this took place in August 1947. Two countries came into being, both dominions within the British Commonwealth – India and Pakistan. Pakistan consisted of those areas where a predominantly Muslim population lived, and was therefore divided into two parts, West Pakistan and East Pakistan. However, in those areas where the two communities lived side-by-side, especially in the Punjab, the boundaries could be nothing other than arbitrary. As a result, on Partition refugees streamed across the borders in both directions seeking a new homeland. This mass migration was accompanied by horrific violence in which an estimated million people were killed. Almost immediately after independence, India and Pakistan were at war with one another over the frontier province of Kashmir (1947-9). The war ended in stalemate and Kashmir has been a bone of contention between the two countries ever since. 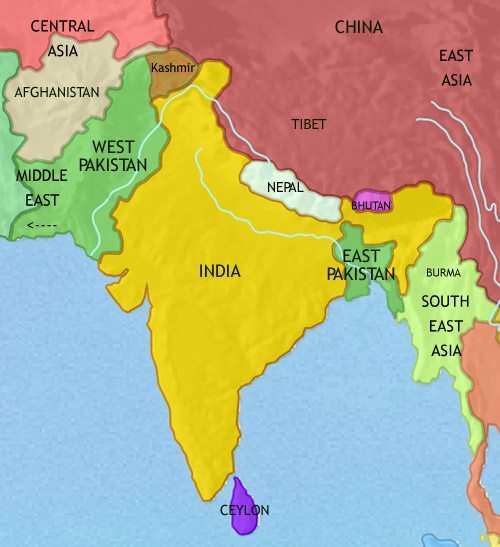 Sri Lanka (then known as Ceylon) became an independent nation in 1948. The history of South Asia has been characterised by mutual hostility between the different states. Tensions erupted into all-out war in 1971, in which India helped East Pakistan to establish itself as the independent country of Bangladesh. Indira Gandhi, the prime minister of India, grew more authoritarian in the years following the war and declared a State of Emergency in 1975. However, democracy was restored two years later. From the 1990’s, following a major liberalization of India’s economy, the country has experienced rapid growth. One of the most visible consequences of this has been the rise of a new middle class in India. Pakistan has see-sawed between civilian and military rule ever since independence. The country’s economy has not expanded at anything like the same rate as India’s. Kashmir has remained a bone of contention between India and Pakistan, and the two countries remain deeply suspicious of one another. The situation is aggravated by the fact that both countries now possess nuclear-armed missiles.